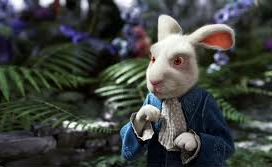 I chose the white rabbit from alice and wonderland, this rabbit is constantly worrying about the time and gets very panicky and always rushes. The rabbit s very fast when the rabbit needs to be somewhere, but when he doesn't he's very relaxed. I chose this character because I'm just like that, when someone says I need to be somewhere even if it is just for fun, i need to be on time. If I'm not it will bother me the whole time and I will rush. I am always constantly looking at the time when I need to be somewhere because I hate it when I'm late. When I am late to anything I will rush even if it is unnecessary, I am just like this character.